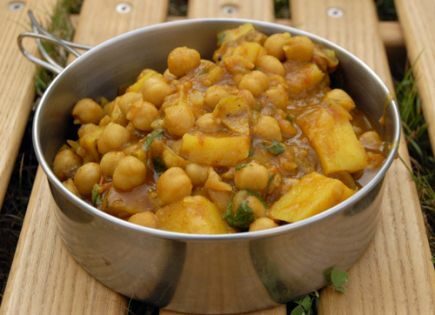 This delicious Indian meal is really not hard to make; get ingredients from your local grocery store or Asian food market and plan time to dehydrate it. Dreams of this lightweight meal in your pack will motivate you to finish a long day’s outing. At home, it is helpful to prepare and measure all the ingredients before you start. Heat the oil in a heavy bottomed pot over medium-high heat. Add the cumin seeds and once they start popping, about 25 seconds, add the onion. Sauté the onion until it starts to brown slightly. Then add the chili pepper, garlic and ginger and stir well. Quickly add the tomatoes and let it simmer for about 5 minutes. Meanwhile cut the potatoes into bite-sized pieces. Reduce the heat to medium. Add the salt, coriander, garam masala and turmeric and stir well. Then add the potatoes, stirring to coat them with the onion, tomato and spice mixture. Add 1 cup of water and bring to a boil. Reduce the heat to low, cover and simmer for 20 minutes or until the potatoes are soft. Add the chickpeas and more water if necessary and let simmer for another 20 minutes. Remove the chana masala from the heat and add the cilantro. Let the mixture sit with the lid on for 15 to 20 minutes before dehydrating. Write down how much of the chana masala you are dehydrating (for example, 6 cups) on a note. Place the food on lined dehydrator trays and dry for 7 to 10 hours. Put the dried ingredients and the note in a Ziplock freezer bag. At camp, add boiling water and the dried ingredients in a pot to equal the measurement on your note (in this example, the water and dried ingredients will make 6 cups combined). You can always add more water if you need to. Put the pot in a cozy and let it sit for 20 to 30 minutes until it’s fully hydrated. When the meal fully rehydrates, reheat it if necessary. Serve with chapatti, naan bread or pitas, if desired.